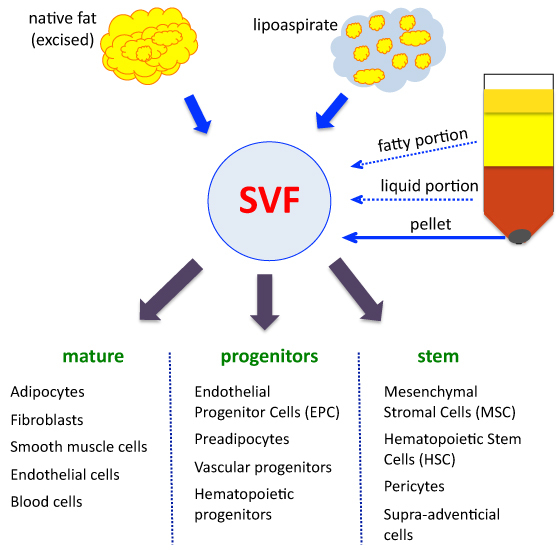 Human stromal vascular fraction (hSVF) is freshly isolated heterogeneous cell fraction derived from native adipose tissue or liposuction aspirates from normal donors, patients with Obesity (BMI>30) or Type 2 Diabetes. SVF is what remained in the pellet after removal of blood and fat components. It is crude and heterogeneous mix of multiple cell populations with different degree of maturity and function. Most sources indicate that adipose derived stem cells (ADSC) represent up to 10% (2~10%) of SVF. Endothelial cells (mature and progenitors) represents 7~30% of SVF. Fibroblasts could represent up to 50% of SVF. CD34+ cells are present at large number and could compose up to 63% of SVF. iXCells Biotechnologies offers SVF from human subcutaneous white fat tissue. These cells are negative for HIV-1, HBV, HCV, mycoplasma, bacteria, yeast, and fungi. Figure 1. Derivation of SVF and its composition. Bourin P, et al and Gimble JM. Stromal cells from the adipose tissue-derived stromal vascular fraction and culture expanded adipose tissue-derived stromal/stem cells: a joint statement of the International Federation for Adipose Therapeutics and Science (IFATS) and the International Society for Cellular Therapy (ISCT). Cytotherapy, 2013; 15(6):641-648. Gimble JM, et al and Guilak F. Concise review: Adipose-derived stromal vascular fraction cells and stem cells: let’s not get lost in translation. Stem Cells. 2011; 29(5):749-754.